Let the inspiring views and hues of early winter bring you warm feelings of friends, family and festivities. 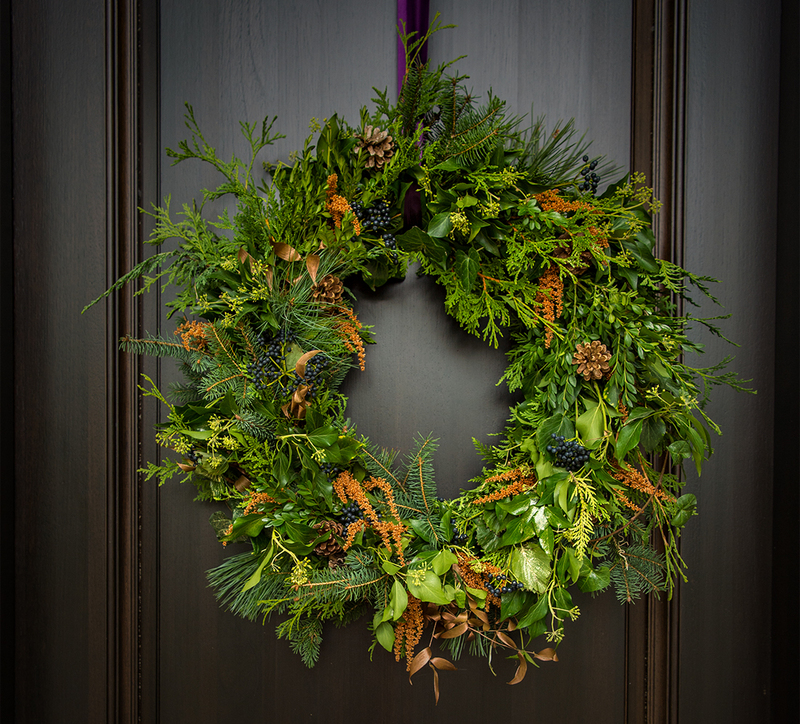 Fresh cedar, pine, and fir embellished with blue viburnum berries, golden amaranthus, pinecones and ivy epitomize natural beauty to welcome the holiday season. 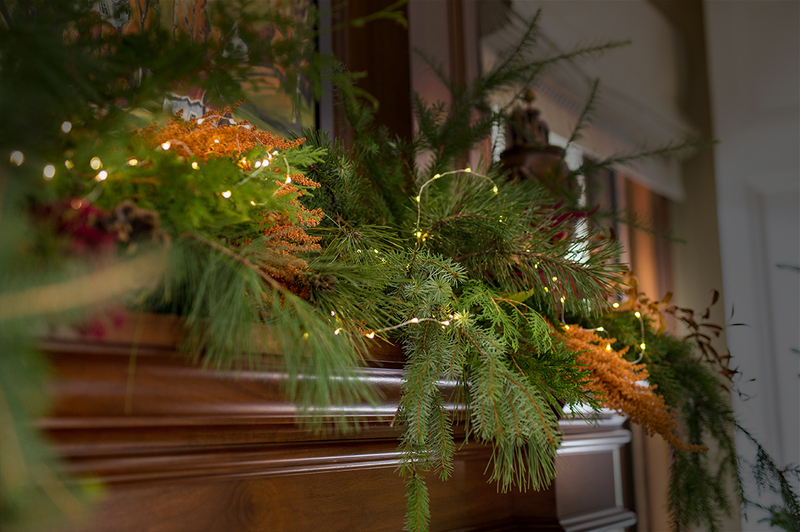 An abundance of fresh pine and cedar from Riverwood Gardens is arranged across the mantel. 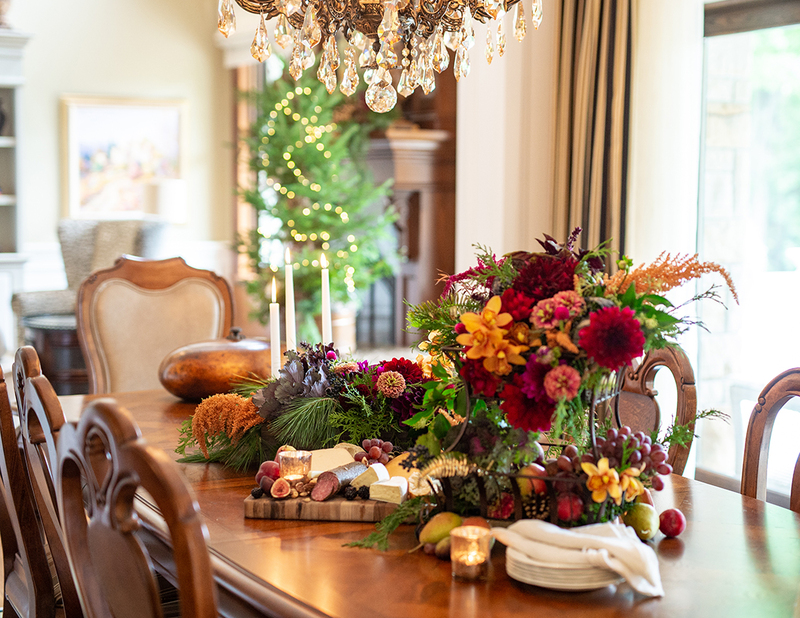 Dark, rich burgundy and golden amaranthus are layered in, along with ivy and a collection of pinecones in various sizes. 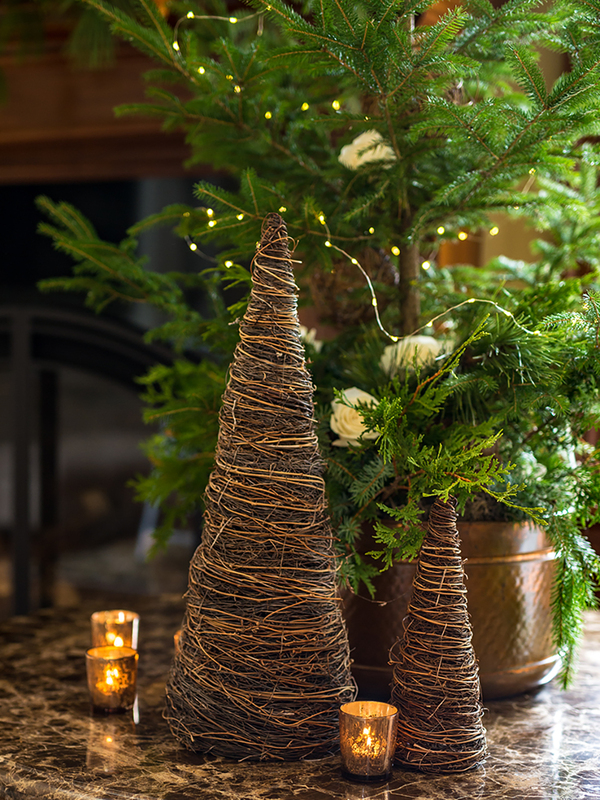 A sprinkling of fairy lights creates holiday sparkle and magic. These colours were chosen to reflect the artwork on the mantel and the colours of the interior of this gracious home. A large and lush arrangement of fresh greens from the farm greets all who enter. Roses, garden blooms, orchids, and gilded tropical greenery overflow a vintage metal vessel. Candles complete the look. 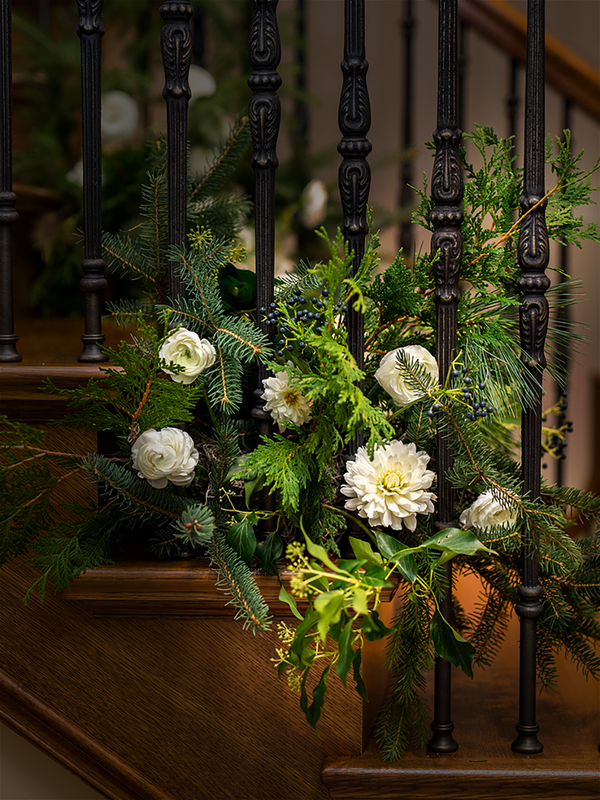 Fresh greens and white flowers cascade down the stairway to create a natural and abundant style for the holiday season. Four live trees, planted in zinc containers with moss, cones, and extra greens around the base of each, add oomph. 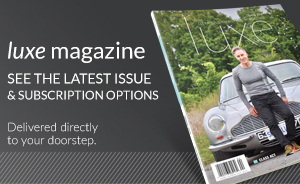 Sparkle and light complete the look. 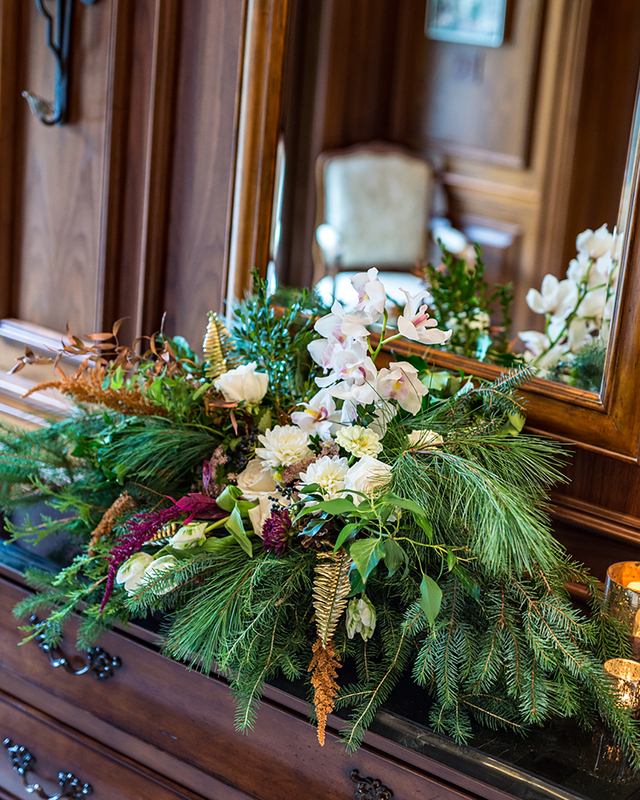 A lovely arrangement of garden roses, viburnum, ivy, and gilded leaves adds panache. It’s a good thing to create holiday looks that do not always fall into the traditional red-white-and-green theme of the season. The warm, rich hues of the flowers set the tone here. Reds, oranges, mustard yellow, burgundy and purple are incorporated into this mix of garden flowers, roses and orchids, along with an occasional fruit or vegetable. See if you can spot the kale. A charcuterie board completes the look.